Although gift paper serves as the conventional method for wrapping presents, several factors may inhibit people to use it. For instance, it can be costly and it's not reusable. Access to it can also be limited for people living in rural areas. Because of these factors, some people are wrapping presents with other presents. One common gift wrap is towels. Common items that newlyweds register for are for the bathroom and kitchen. A creative way to wrap these kinds of gifts is with towels instead of paper. 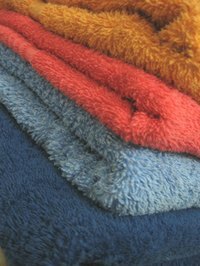 Towels, of course, are common items in the bathroom and kitchen. Giving towels makes the packaging a part of the gift itself. Pamper baskets are one way to package gifts. These custom-made baskets consist of a collection of items designed to cater to, or pamper, an activity, theme or hobby. Common ideas are spa and bath themes, which could include lotions, soaps, specialty shampoos and candles. However, instead of placing gifts in baskets or gift bags, an alternative is to place the items in a towel. This way, the towel relates to the spa and bath theme and can also function as part of the gift basket. The technique could also apply for cookware, as the towels can act as the basket for items like cookbooks, mixing utensils and recipe cards. Aside from being used as an alternative to wrapping paper, towels can decorate a gift. One way to do this is to place gift items inside a towel and then tie the towel into a bow. You can use this strategy for cooking utensils and bake-ware, as it goes with the towel gift theme.